Yesterday's post about the removal from YouTube of John McLaughlin Williams playing Philippa Schuyler's music lamented the totally unacceptable and arbitrary control that Google exercises over our lives. My online protest against the removal of the video - which was accompanied by a formal appeal to YouTube - quickly received significant support. Within twelve hours of the protest going online the message above was received from YouTube. No apology or explanation has been offered by YouTube for what John McLaughlin Williams described on Facebook as "an embarrassingly craven and undeserved act of censorship". In one of the supportive comments added to my protest, composer Kevin Scott describes Philippa Schuyler as "a complex and intriguing American woman". 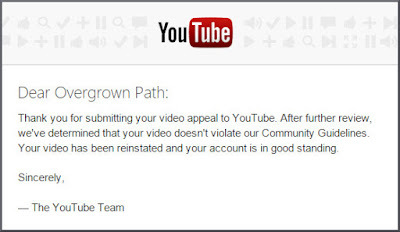 The frightening thing is that John McLaughlin Williams' important contribution to the study of Philippa would have remained arbitrarily censored if On An Overgrown Path - and that includes its readers who are as important to the blog as me - had not robustly confronted YouTube and its parent Goggle. What other material arbitrarily deemed inappropriate has been more successfully censored by Google? The now uncensored performance of Philippa Schuyler's music is embedded below. John McLaughlin Williams' invaluable and eloquent analysis of her music can be read via this link. One of the profound ironies of Schuylergate is that, as a result of YouTube's attempted censorship, many more people more people are now reading about Philippa Schuyler and listening to her music, as is evidenced by the blog's traffic logs. This highlights one of the many aspects of online culture that I dislike intensely; namely that controversy is a very powerful promotional tool. It is this aspect that is exploited successfully and distastefully by the practitioners of music churnalism. I suspect that Google is somewhat unfairly being labelled the villain here. Here's what I think happened. Someone (for whatever reason) reported your video as inappropriate. Google computers likely then made the video unavailable pending review or request for review. As you can see, the video was quite promptly made available again. I suspect that Google plays it safe when a video is reported as inappropriate. One can only imagine the sort of stuff that people try to upload. And rather than having something 'unacceptable' available until staff can get around to looking at it, they block access for the interim. "I suspect that Google is somewhat unfairly being labelled the villain here". Canoetoo, try this scenario for size. An anonymous person phones the police and reports you for an unspecified crime you didn't commit. So the police arrest you and hold you without trial pending an appeal; moreover they warn you in an officious way that any further alleged - not proven - unspecified offense will result in life in prison. You are not told what crime you committed, your appeal will not be independently judged and there is no guarantee it will be fair. Moreover, when you are finally released no explanation is given for your wrongful arrest, and no apology is made. Google - as do Facebook, Amazon and the other online pariahs - take the route of least cost. Using unpaid vigilantes costs nothing, and the fallibility or bias of these vigilantes can conveniently be justified because of the need to play it safe. Research how Google and Facebook harvest and sell your personal data to supplement their huge profits. Understand how the online giants pay minimal tax. Explore how the online economy exploits free and slave labour through operations such as Mechanical Turk. Read Jacob Silverman's Terms of Service and Andrew Keen's The Internet is Not the Answer. Then tell me if " Google is somewhat unfairly being labelled the villain". As long as we view YouTube, Google and Facebook as nice friendly corporations because they allow us to share videos of our cats for free, they will increase the totally unacceptable and arbitrary control they exercise over our lives. One of a number of reasons why On An Overgrown Path will shortly lapse into silence is that I find the internet an increasingly uncomfortable place to spend time.